You've probably heard of the cheap $1.90 boat noodles at Golden Mile Complex (which we happen to love). Well, Gu Thai Noodle Cafe has brought the same concept to a more accessible location. There's a wider range of food available here, though their noodles remain as the highlight for us. It's a great supper location, by virtue of their opening hours and location, especially for a late night meal after watching a movie nearby. The Braised Beef Tendons Boat Noodles is topped with braised beef brisket and a generous portion of fried minced garlic. And of course you can see the signature spicy chilli flakes on the left. Boat noodles are perhaps the most common dish to be eaten at establishments like this. Especially if you can get a small bowl for just $1.90. We ordered the "braised beef tendons" variant with Thai glass noodles and chose the spicy broth option (you can also choose a non-spicy version). The "braised beef tendons" were in fact braised beef brisket, so you get some meat with your "tendons". The beef brisket was layered with cartilage (hence the reference to "tendons"). When cartilage (which is essentially collagen fibres) is cooked appropriately, it gelatinises and becomes tender, with a melt-in-your-mouth texture not unlike fat. The beef brisket was cooked perfectly - it was moist and flavourful, yet extremely, extremely tender because of the collagen/cooked cartilage. We were actually surprised by how well the beef was executed. The layers of cartilage felt like marbling on good wagyu steak. The broth was very much what you'd expect of boat noodles. It was both sweet and savoury, with punchy beef notes. In the spicy version of the broth, the rich beefy flavour is counter-balanced by the extreme spiciness, which has a very mild, almost herbal taste. Beware though, because the spicy version of the broth really is spicy. The kind of spicy that might turn your face flush red and cause extreme perspiration. It's still a really tasty experience. The glass noodles were great at absorbing the soup as you ate them, and were springy. You can also choose other types of noodles if you want. The additional garnish of fried minced garlic was very appreciated. It's crispy and flavourful. If you love garlic you'll absolutely love this. There was also some Thai kangkong vegetables in the dish - the kind with hollow stems. This was a real tasty delight, though we had trouble finishing it because of the spiciness, and had to punctuate eating the dish with sips from their Thai ice milk coffee. 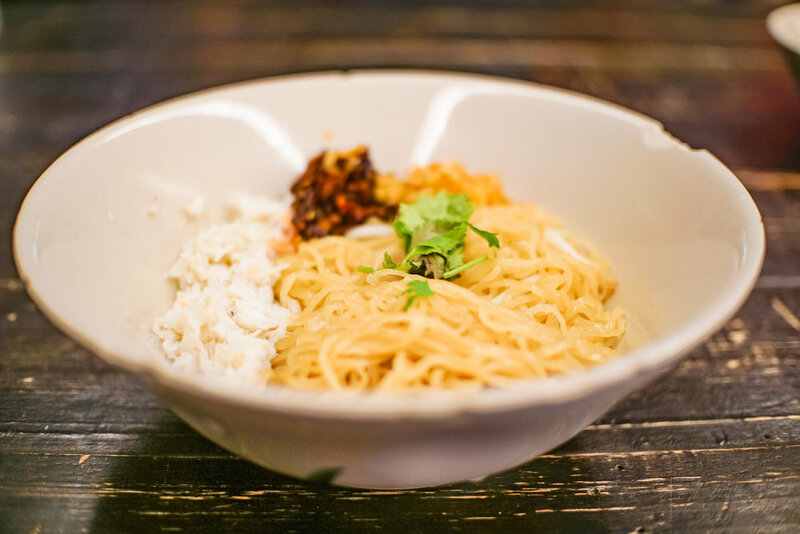 The Bah Mee consisted of mee kia noodles, crab meat to the left, and chilli flakes and fried minced garlic in the background. We also opted for the dry Bah Mee, which is noodles with crab meat. The crab meat flakes were tasty and went well with the noodles. You're not getting restaurant-grade seafood here, but it's still fresh and delicious. The dry Bah Mee had some sauces added, but the noodles were bland in comparison to the Boat Noodles. We did enjoy the mee kia more than the glass noodles, but we had to add a little bit of fish sauce and broth to the noodles for better flavour. Speaking of which, the Bah Mee did come with a small, separate bowl of the same broth used for the Boat Noodles. Rather remarkably, because this broth was the non-spicy version, there was a difference in flavour from the spicy broth. The Bah Mee came with a small bowl of broth on the side. Because there's a variety of spices in the chilli flake mixture (and not just chilli), the taste of the soup changes when it's not the spicy version. The broth tasted sweeter, but still had the same rich beef taste. Somehow though, we still preferred the spicy version of the broth even if it meant sweating profusely and enduring numbing spiciness. Overall, the Bah Mee was also a nice meal, with the crab meat as its highlight. We had to pause between mouthfuls of the Boat Noodles to sip the Ice Thai Milk Coffee (to the right). We also decided to try the Ice Thai Milk Coffee, instead of the more popular Thai Milk Tea. The coffee was nice, like a variant of the local Kopi, but with richer flavours (and tasting less burnt). To describe it in a crass manner, it was like a powered-up version of 3-in-1 coffee. Not that this is a bad thing - we enjoyed the sweet coffee, and it definitely helped cool us down after eating the spicy Boat Noodles. We used the 1-for-1 promotion on the Entertainer app for this meal, so we only had to pay for one of the bowls of the noodles, and the other bowl was free. With this in mind, we found the meal extremely value-for-money. Coupled with the great taste (and long opening hours), we think this is the perfect supper location, especially after watching a late night movie at the Grand Cathay or Plaza Singapura nearby. Do we enjoy the smart life with this? Yes, especially with the 1-for-1 Entertainer app promotion. Who should eat this? Anyone looking for a delicious supper, or who loves boat noodles. Who shouldn't eat this? Anyone looking for a gourmet or healthy meal.